“There’s only two things that last,” I’ve been told many times. Those two being people and God. Understanding this should change the way we live, however, I dare say it normally doesn’t. ( I can truly only speak of myself, of course.) This has been something weighing on my heart recently. Sometimes I struggle with people, because I feel as though I won’t have them for long. I’ve had many come and go. Many friendships that have blessed me through a season soon dissipate. That’s life and God sends the right people at the right time, I do believe that. Being in a dorm with many girls gives many the opportunity to put the importance of others in action. Sometimes even saying “hi” to someone in the hall can be difficult. At the present, I’m in a slight funk, because I’ve been missing terribly friendships that are long distance, or are barely hanging on. This makes me want to hide from everyone. I don’t know if I’m the only one who has experienced this. Friendships are work, girls are work…people are work, but they are worth it. Why? because they are the only thing on this earth with eternal value. I’ve been blessed in my life to always have people around me who I’ve adored and have pointed me to Christ. It’s only fair that I do the same to others. I’ve been super emotional recently for multiple reasons. 1.) I’m a girl. 2.) I’m a girl 3.) because I have no idea what to do after school. 4.) I’m so stinking close to graduating. This has caused me to evaluate. Here’s what I’ve been thinking about repeatedly the last couple of days “What has Christian College done for me? How has it changed me? What have I learned?” A lot. Last night I went to a worship night that was student lead by three senior guys. I couldn’t help but thinking how much they had grown in the years I’ve known them. We all have. Every single person in my class is different, more mature, than they were when they came. That’s a big accomplishment for my school, I’d say. Along with general growth, there’s also the way I deal with people. Being with the students all day everyday has definitely improved my people skills (or at least I’d like to think so.) I feel like I’ve really learned the value of sharing life with people. My organization, leadership, teaching, knowledge of the Word are all areas I feel like I’ve grown. It’s terrifying to me that it’s all coming to an end. It’s terrifying to me that I won’t be in the comfort of my dear family here at school. I don’t know when I’ll see them again after we graduate, but here’s what I do know…I’m so proud of them. I have faith that whatever they do with their lives will be honoring to the Lord. They are a part of me that won’t be left behind, wherever I go in this life. I’ll get to worship the Lord with them in heaven, just like these three years at school together. Has it been worth it? The whole Christian College experience worth it? Yes, with all my heart, I say yes to Christian Colleges. I’m not sure what I’m going to do after school yet, other than ministry. However, I know God knows and that He’s already there. So, I guess I’ll just have to wait and see. It was also lecture week and the topic was 1 & 2 Thessalonians. Seriously, my favorite week in the whole semester…well it might be tied with when we do all the Christmas things. The speaker was delightful and had such a pleasant spirit about him, the kind that makes you eager to learn from. Can I just say, I love having a mama?! She is such a gift. I haven’t had the chance to have a really good face to face conversation with my mommy in months, much less a full day of them. It was a great reminder of who I am and how much I need her. I can get to this place where I feel alone, as if I’m all grown up and I have to make all of the choices. God gave us family for a reason. They support us, guide us and love us through all of life’s surprises. I’m still such much a kid. I can’t handle all of the adult stuff, I can handle some, but I’m still growing. With that said, I’m a kid who still needs her mom sometimes to treat her as such. This has got me thinking about something our lecture speaker said. He explained that it’s not reading the Bible or doing certain things that make us grow, but rather that puts us in the path of growth. God still has to do it in us. I can get the “adult” mindset a little too much with God too. I need Him though, I need to be His child and for Him guide me. So, like I said. It’s been a good week of being a kid. This semester more than ever, I’ve struggled with this very thing. I’ve grown weary time and time again while doing good. Hectic chaos, that’s been my life. I came into school loving life. I continued school, loving life. I got a job as a waitress (something totally new for me) and soon after got offered a second job in a coffee shop. All of these new experiences, I felt so grown up. I was going to be awesome at everything, every job, every assignment, every relationship; all of the things. I figured since God had opened so many doors that all of them must be right. It didn’t take long for me to realize that keeping up with a job and being an RA was going to be a challenge. Work would cause me to leave right after classes and get back after curfew. All of my girl friends would say “I feel like I haven’t seen you in forever.” I felt the same. I would then go into my room and do the homework due for the next day. I was growing weary. God never left me though, not even for a second. He was my comfort in the moments I thought I was going to die. Even in the craziest moments, I can honestly say I had a joy. Then there came last week (at least, I think it was last week.) All this guilt hit me. I had committed myself to a ministry, serving my section. I had committed myself to doing well my senior year and truly loving it. Somehow it had dropped on my priority list. God has taught me that life is full of choices. There can be multiple “good” things to do. He’s with me through it all. He’s also shown me that I lose sight of my goals pretty easily. Soon after I got offered my second job, I refused it and just two nights ago put in my two weeks as a server. I already feel so much better. I’ve also really missed my family this semester. I guess the idea of starting full time ministry next year, possibly away from them scares me. They might not always realize (because I have a very prideful-independent spirit) but I hate being away from them. That’s a challenge that can bring me to weariness. My emotions have been everywhere. I’ve been battling with depression. That’s a challenge that can bring me to weariness. Now that I’m jobless (or will be in two weeks) I’m very much looking forward to things calming down just a little. Maybe I’ll actually get to sleep, who knows? What is for sure though is God. That is something I never for a second want to forget, though I know I will. Being in a secular work environment, being away from my family and feeling disoriented at school as made me so grateful that I will never be without Him. He’s in my future, He’s in my past and in every moment of the present. “casting all your cares upon Him, for He cares for you.” 1 Peter 4:7 I recently learned that this “care” spoken of here is both one of affection and also protection. Isn’t that amazing? 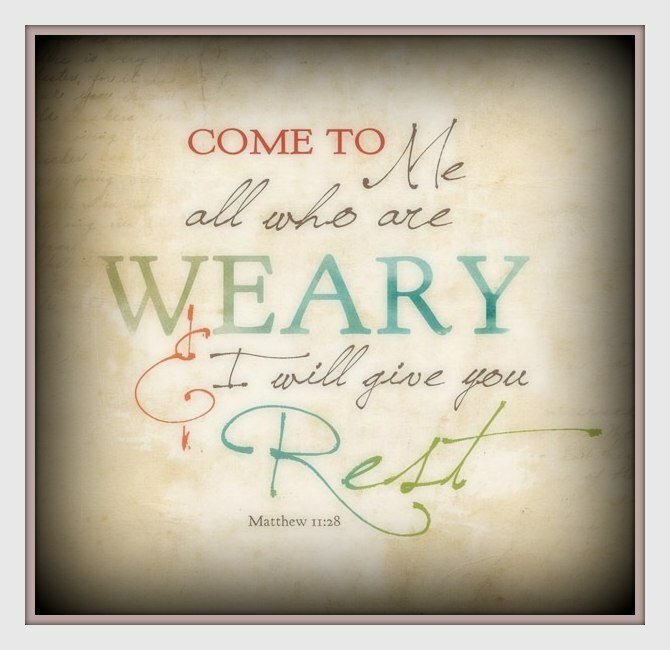 We need to cast all weariness on Him because He has affectionate love for us and He will take care of us like a parent. So, I can honestly say, I will continue to grow weary at times, but I will also continue to cast my cares upon God.